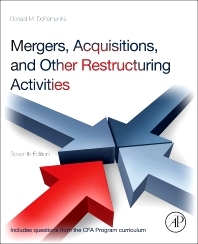 In the seventh edition of Mergers, Acquisitions, and Other Restructuring Activities – winner of a 2014 Textbook Excellence Award (Texty) from the Text and Academic Authors Association – Donald DePamphilis looks into the heart of current economic trends. In addition to a new chapter on the ways deals are financed, more than 85% of the 54 integrative case studies are new and involve transactions announced or completed since 2010. This new edition anchors its insights and conclusions in the most recent academic research, with references to more than 170 empirical studies published in leading peer-reviewed journals since 2010. Practical exhibits, case studies involving diverse transactions, easy-to-understand numerical examples, and hundreds of discussion questions and practical exercises are included. This substantially updated content, supplemented by questions from CFA Institute examinations, offers the only comprehensive exploration of today's business transactions. Mergers, acquisitions, and restructuring transactions reveal the inner workings of our economy. This longstanding, award-winning treatment lays out what every student and professional should understand about their parts, what they are intended to accomplish, and what their competitive, strategic, and value consequences are. Advanced undergraduate, graduate, and MBA students worldwide taking courses in mergers & acquisitions, corporate restructuring, valuation, and corporate strategy. What are Privately Held Companies? How are M&A Transactions Commonly Financed? What is the Role of Private Equity, Hedge, and Venture Capital Funds in Deal Financing? What Factors are Critical to Successful LBOs? What Makes Business Alliances Successful? Why do Firms Exit Businesses? How are Cross-Border Transactions Valued?